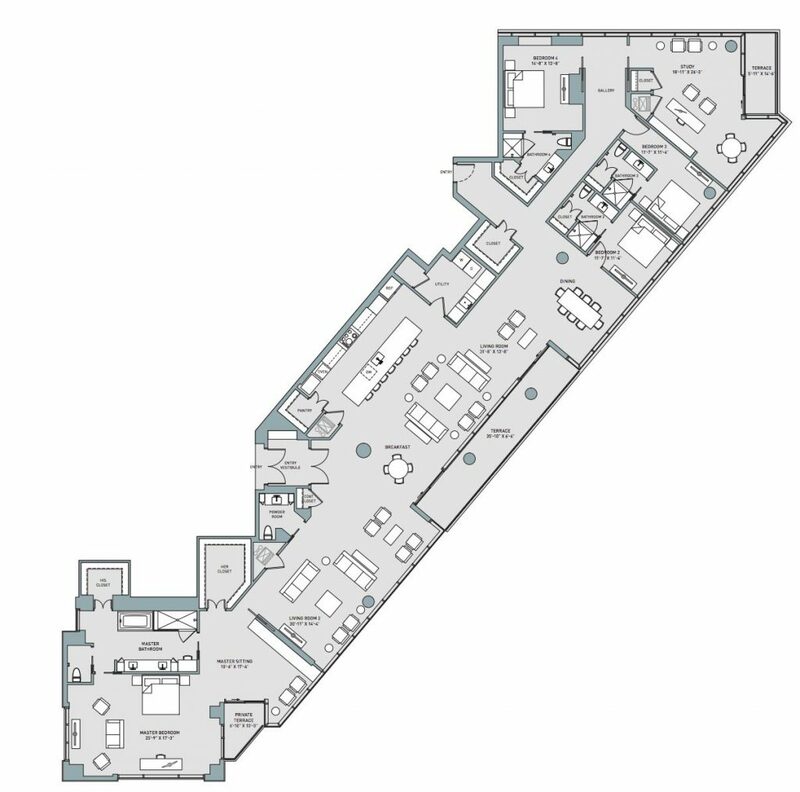 The D1 penthouse at Fifth & West has a curious shape — it’s a parallelogram of sorts, but more like the forward slash on a keyboard. 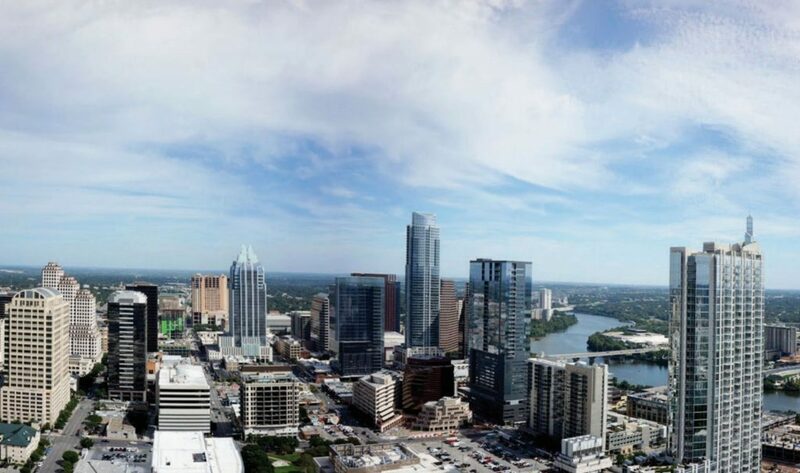 Located on the 39th floor, it’s set to become the fourth highest residence in Austin at 448 feet. 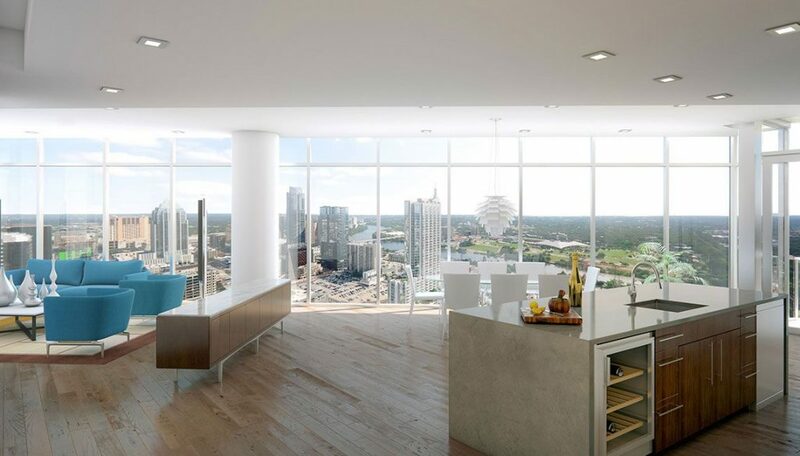 The four bedroom, four bathroom plus study is linear and luxurious, with floor-to-ceiling windows that offer views of the city skyline and Colorado River. The main entryway leads into an open-concept kitchen with a large island and ample bar seating. It’s outfitted with energy-efficient Miele appliances and sleek quartz countertops. The walk-in pantry is tucked away in the corner, while the prep zone is streamlined. The main living room is more of a formal sitting area, and its openness allows the homeowner to chat with guests while preparing a meal in the kitchen. A terrace runs the length of the space, giving it a bright and airy feel. There’s also a breakfast nook and a separate dining area for larger gatherings. The second living room has a more relaxed vibe, and would likely be focused around a TV. It’s adjacent to the master bedroom, which features a sitting area, his and hers walk-in closets and a private terrace. The ensuite boasts sumptuous marble floors, a partitioned toilet, double sink vanity, soaker tub and walk-in shower. The other wing of the penthouse is home to three additional bedrooms, which each have their own full bathroom and walk-in closet (children don’t like to share anyways). There’s a comfortable study with a terrace that could also serve as a playroom or home theatre. While it might be a bit odd, the shape of the penthouse makes it nearly impossible to get lost, a true feat considering its extensive square footage. Highlight: The building offers an indoor pet owners lounge and park. You’ll never have to walk Fluffy in the rain again.